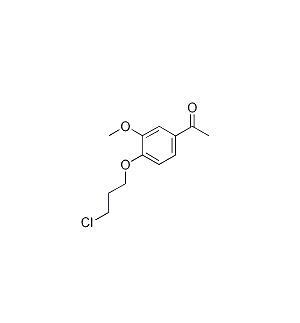 1-4-(3-Chloro-propoxy)-3-Methoxy phenyl) ethanone CAS 58113-30-7 is used to synthesis Iloperidone.it generally has two synthetic methods, one is using Acetovanillone and 1-Bromo-3-chloropropane as raw materials, acetone as solvent, potassium carbonate as the deacid reagent, reflux reaction for 24 hours to get the target compound,after get the target compound, there will be a new compound generated at the same time, this material can not be moved out by crystallization, will affect the purity of the final product. The other is the starting material is same as before, adding sodium carbonate or sodium hydride to get the target compound. This method has less by-product with higher purity. In the synthetic system of iloperidone, it is generally reacted with the minus two intermediate of iloperidone to get crude iloperidone. Iloperidone is a potent atypical antipsychotic which is widely used to treatment of schizophrenia. The Iloperidone Intermediates CAS NO 58113-30-7 is high effective, fast action and high purity with the molecular formula of C12H15ClO3 and formula weight 242.6987. We can offer fast delivery and best service. Looking for ideal 58113-30-7 Manufacturer & supplier ? We have a wide selection at great prices to help you get creative. All the CAS 58113-30-7 are quality guaranteed. We are China Origin Factory of CAS NUMBER 58113-30-7. If you have any question, please feel free to contact us.